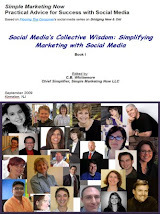 Simple Marketing Blog: Will You Share Facebook, Twitter Business Success Stories? Will You Share Facebook, Twitter Business Success Stories? I need your help to counter a claim that Twitter and Facebook are a waste for business, and specifically flooring related businesses. Do you have a success story to share?